"There was this animal called a zebra. Do you know what it looks like? No? OK, well you know a horse? It's like that but with stripes. "Then there was this other animal called a giraffe. Never heard of that either, hey? Well you know a horse? It's like that, but with a long neck. "There was yet another animal. It's called an alligator. OK, so you said you knew what a horse is, right? Well, it's not like that all." And that's Poltava for you. It's different from other Ukrainian cities for reasons you can't quite say why. But that's what makes it interesting, and a bit magical. It did take a bit of adjusting at first, since Russian is popular there. 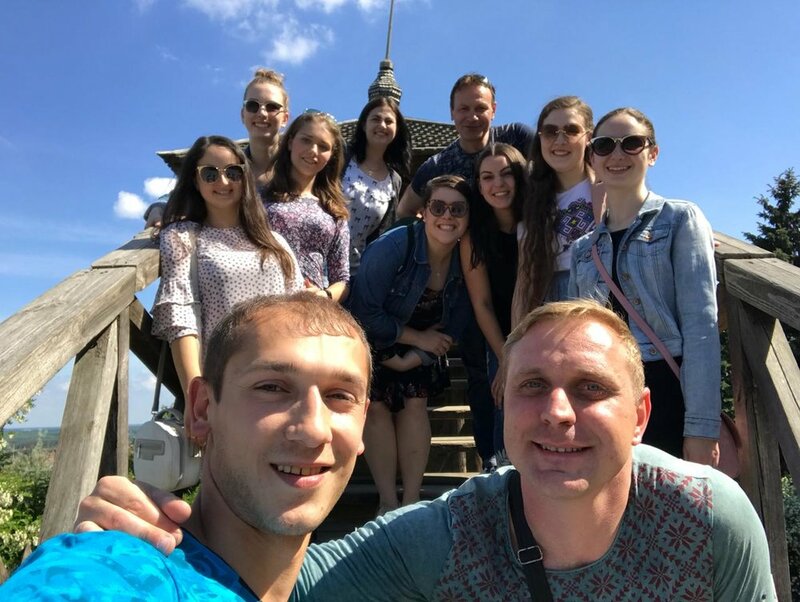 People told us in other cities we were in we'd hear more Russian than Ukrainian, but that really wasn't the case except for Kyiv, and now Poltava. Some people were kind enough to switch to Ukrainian when they heard us speaking (or trying to speak) Ukrainian. Some were even excited about it and asked us why we were in their city. I lived in Poltava, which has a population of about 295,000, for only six weeks, rather than eight like the other cities, but I still got lots of exploring in. Read on below for a few highlights about the city. We learned a dance within our first couple days with the Poltava Song & Dance Ensemble. And then we learned another. And another after that, then another. By the end of a few weeks, we knew four complete dances, confident enough to even perform them. We also learned sections of other dances, plus countless barre exercises and technique drills. I can't wait to see the Poltava Philharmonic once all the renos are done. Rehearsal started at 10 am. We did 45 minutes of ballet run by dancer Serhiy Stupak, first at the barre then in the centre, then had a break. We came back for 45 minutes of technique with artistic director and Honoured Artist of Ukraine Vadim Perepelkin — I really should have tried to calculate how many turns I did in my time there because wow, we did a lot — then had a break. Then we finished with 45+ minutes of choreography. We rehearsed at the Poltava Philharmonic, which is undergoing renovations. There aren't any performances in the building right now, just rehearsals, but I can't wait to go back and see the completed theatre. The ensemble was ever so welcoming. They took us out for lunch, walked with us around town, and recommended places to check out. They treated us like one of their own, which was made completely clear at the birthday celebration of Vadim Perepelkin, who we liked to call Pan (Mr.) Poltava. We went into the studio for rehearsal as usual but had a shorter ballet class so we could set up for the party. The dancers somehow transformed the old theatre seats, chairs, and some kind of board from the side of the studio into a table and covered it with food and drink — roast chicken, halushky (more on that below), salads, wine, and horilka (vodka). Between courses, the studio turned into a makeshift club/dance workshop space. Some of the dancers who perform with other groups taught us some combos, which was fun because it was more jazz/hip-hop inspired than Ukrainian, something that is not my forte but I am still always game to give it a shot. The Rotunda of Friendship with the Poltava Ensemble. Hanging out at the halushky monument. 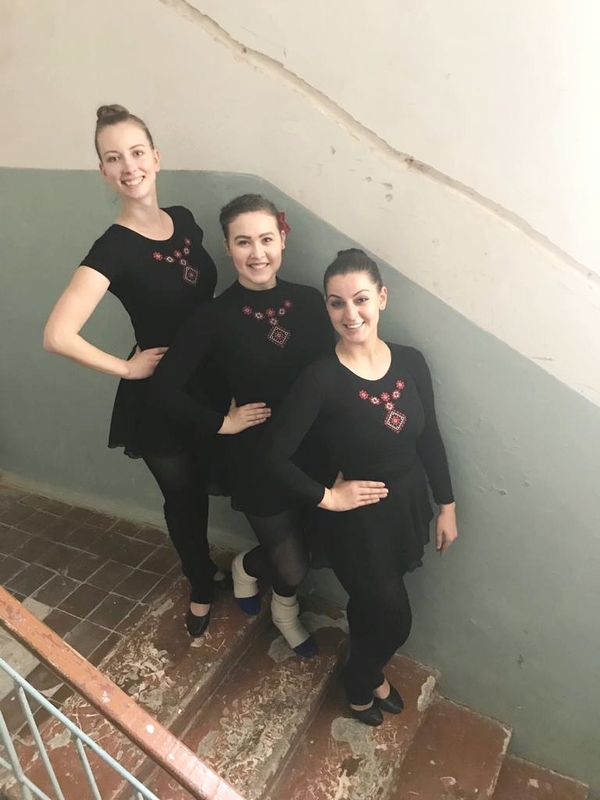 Natalya, Kaitlyn, and I show off our Postmark Ukraine bodysuits in the Philharmonic. 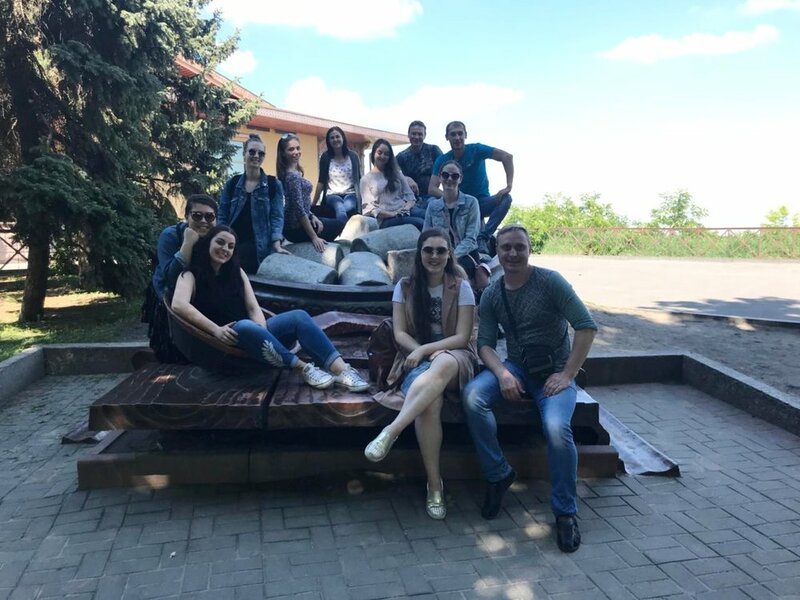 The Cobblestone Freeway Tours Ukrainian Dance Workshop Tour joined us in Poltava for our last few days there. We even got to help lead some of the workshop, showing some of the steps and dances we learned. We tagged onto the workshop tour for the rest of their time. But first, to top off our time in Poltava, and to top off our year in Ukraine, we had one final performance. On June 8, we performed Kozachok with the Poltava Song & Dance Ensemble for the Day of Halushky, a celebration of the regional food of Poltava. It was pretty special, since we grew such a strong connection with the ensemble, Vadim Perepelkin especially. Plus, there was some of our new Canadian and American friends from the workshop tour watching us. I may or may not have had tears in my eyes as we waited side stage, ready to dance one last time with Ensemble Kukurudzy (meaning ensemble of corn, what us Canadians called ourselves, because it's a fun word to say in Ukrainian, plus we were like kernels from various places all brought together on one cob, Ukraine) and the men of the Poltava Ensemble. The Poltava Ensemble ladies and Ensemble Kukurudzy. Photo by Cobblestone Freeway Tours. I am so honoured to have worked with Vadim Perepelkin. He uses the best analogies and metaphors when instructing, and his love for his ensemble shines through every day. The men of the Poltava Ensemble. Kyrylo aka Tato, Vadim aka Pan Poltava, and Vince aka Funcle Wince made our time in Poltava and Ukraine memorable. Hannah and her neighbour catching up one last time. The stage was approximately the size of a postage stamp, but we still had fun, dancing for the audience, ourselves, each other, our families back home, our families in Ukraine, and our ancestors. Ukrainian dancing with a professional ensemble from Ukraine while in Ukraine is a pretty magical experience. And now I will leave you with the advice Pan Poltava ingrained in us (why this even came up in the first place, I don't really remember). "Borshch without sour cream is like kissing without tongue." They are kind of like varenyky (perogies) made of mostly dough, no stuffing, though some do have a filling, like meat for example. It's a Poltava dish, so much so that they have a day named after them, which is what I danced at for my final performance. There's also a halushky monument in Poltava. So yeah, they are a big deal. And incredibly delicious. Halushky: The prized possesion of Poltava. My favourite ones were from the restaurant Halushka on the pedestrian street, Sobornosti Street. Try the cheese ones, which come with both a cheesy sauce and grated cheese on top. I often think about those halushky, though I have yet to try to recreate them. Oh also, here's a fun fact: The varenyky (perogies) are giant in the Poltava oblast (province). Instead of taking a few to accompany your meal, you take one that's the size of a saucer. Like every other Ukrainian city, the market is the place to go. In Poltava, there's the Central Market on Shevchenka Street. It was kind of difficult to navigate, but we managed OK. My favourite markets are still the ones in Lutsk, but the Poltava one had some good finds too. 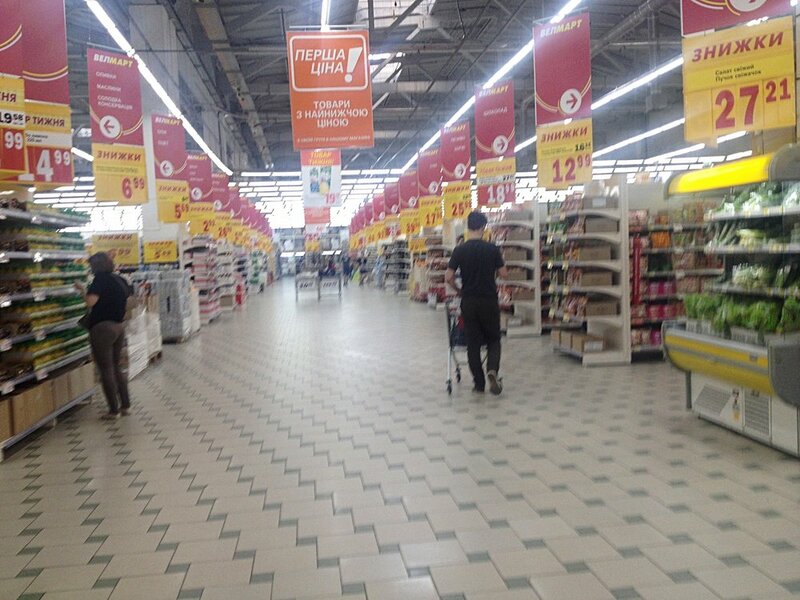 But the place to go in Poltava is Velmart, what we like to call fake Walmart, but it isn't really. One day after dance rehearsal, Pan Poltava said he had somewhere to take us. We thought he said something about groceries, but we weren't positive. Next thing you know, we're waiting at a bus stop, then we get on, travel to who knows where, then get off at Equator Mall. It had some clothing stores, but after walking through the mall, in the ultimate squad — Pan Poltava and his Poltava Princesses — we came to Velmart, a whole new shopping experience. Let me briefly tell you about grocery stores in Ukraine. They don't have much (compared to Canada, that is), but they have what you need. In some stores, you paid for you vegetables separate from your meat which was separate from the other groceries. Go-tos in North America, like canned soup or any type of prepared food or specialty items, don't really exist. Which was fine for me, but I guess I see how people would want more variety in their meals than fried cabbage with salt and pepper and buckwheat. Velmart was a mix between Walmart and Costco. Walmart because it had everything you ever needed, including home items and bulk liquid soap, and Costco because everything seemed giant, including the isles that could fit about 10 carts. I shopped there only once, using the free shuttle and walking 10 minutes back to my apartment. Since we were in Poltava for six weeks, I managed by just going to the smaller and closer stores for fresh fruit and veg after that initial big shop. I got so used to grocery shopping in Ukraine. It wasn't overwhelming like it is here. That's why when I apartment-sat for my friend this past month, I didn't go to a grocery store once, instead taking what I could from my parents' garden (and fridge...thanks!). Poltava is known for its greenspaces. Free benches in parks or along walking paths are tough to come by on any given evening, weekends especially. People are out with their friends, drinking or eating or playing music or just talking. I love how often Ukrainians use public spaces. They spend time in parks and such as if they were their own backyards. 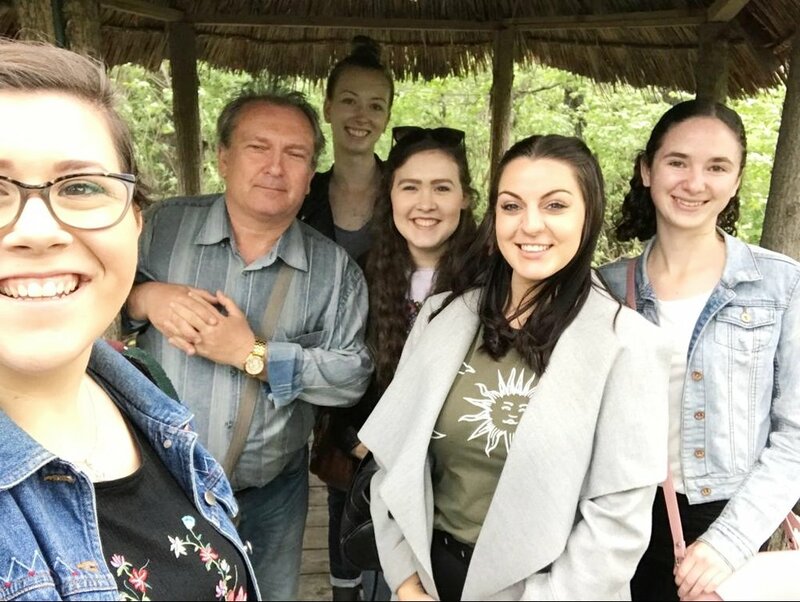 We also had the chance to go on an excursion to the National Museum of Ukrainian Pottery in Opishnya with Pan Poltava. On our way back, we stopped for lunch at a restaurant in the middle of nowhere (it was in Dykanka) that put on a full production, with singing and acting, before we ate, plus while we ate (we ate in a cute village-style home). The Fab Four: The ultimate crew to explore cities with. Keeping cozy on a Poltava patio. Pan Poltava took us to the National Museum of Ukrainian Pottery in Opishnya, on the Poltava Ensemble bus, no less. We crossed this super sturdy bridge to continue exploring the museum grounds. We each tried our hand at pottery. By this I mean we held out our hands, and the potter used them as his own to create something worth taking home. We stopped near Dykanka for lunch on our way back from the museum. Hohol’s The Night Before Christmas is based here, and many things at the restaurant are themed around the story. We got dinner and a show. I loved exploring the lush streets around my apartment, which was near Birch Square. This area reminded me a bit of Winnipeg’s Wolseley neighbourhood. I always had fun exploring cities with Natalya, even if we had no idea where we were going. The courtyard of my apartment was so green and lush and beautiful. One day on my way to language class, I saw these Georgian dancers on the street. All year, we wanted to see the National Ballet of Georgia who toured Ukraine, but it never worked out to see them, so I’m happy I got at least a preview of this incredible style of dancing. Poltava, you were different. But being different is good. It makes you exciting, and a bit mysterious. Poltava is one of the most beautiful cities I've been to. I will forever be thinking about you, and your halushky. Pan Poltava and his princesses.